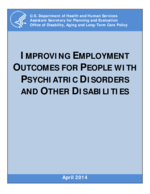 To answer questions on what services and barriers people with psychiatric disorders face, the authors conducted two targeted literature reviews: (1) employment programs and outcomes for people with psychiatric disorders; and (2) employment programs for people with other disabilities. Also analyzed was data from the Survey of Income and Program Participation to examine service-use trajectories of vulnerable populations that might be expected to apply for Social Security Disability Insurance benefits. The authors also examined literature and policy documents that outlined funding options for employment services for people with psychiatric disorders and other disabilities.